Congratulations, You've just met your wedding DJ! We were chosen as Vancouver's BEST Wedding DJ 2016 finalist at the Professional BC Wedding Awards. Their criteria is rigorous and highly competitive. Not any DJ gets chosen as the best! Ask yourself, do you want just anyone as your DJ who perhaps doesn't quite have what it takes when it counts the most? I'm sure you don't want to take the risk on your amazing wedding night. 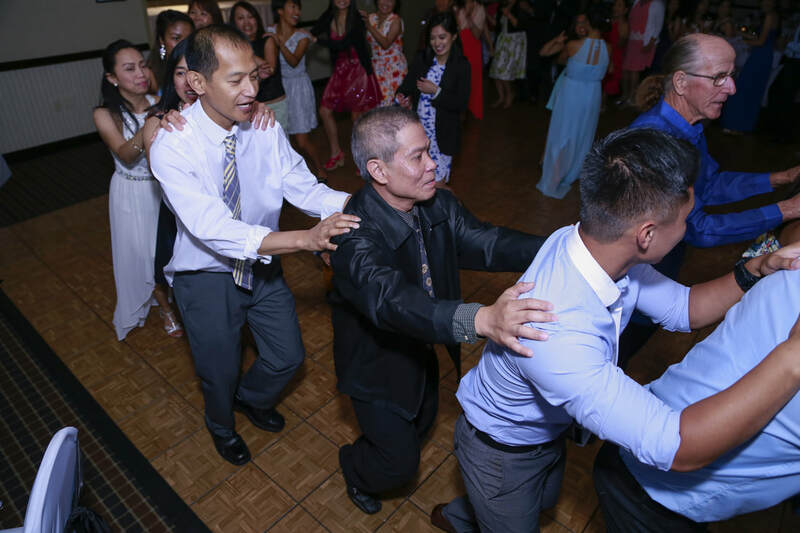 Rely on 20+ years of Vancouver DJ experience, Dynamic Weddings DJ Service! Hire an award winning service! The planning is done, the vows are complete, speeches made, cake cut and nothing left but to Party!!!!! But wait! Are you sure you want to leave it to an amateur? A Dynamic DJ will give you a night to remember! Our digital music library is amazing! We have over 200,000 licensed digital tracks. We have all the classic party favourites including the latest hits, updated bi-weekly. We also have a wide variety of ethnic music including Italian, Portuguese, Latin, Chinese, Persian, Arabic & Croatian. We use the best DJ software available which allows us to beat match and organize your play lists. Our music genres range from the 1950's to the hottest new releases including exclusive radio edits of pop, rock, hip hop, dance, and ballads. Your wish is our command. 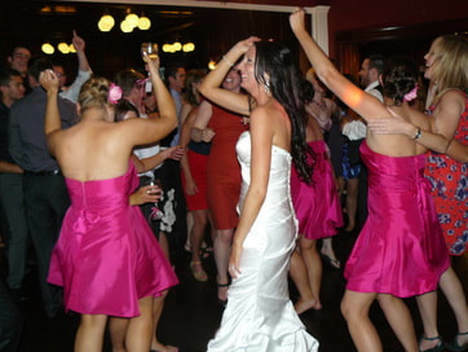 Our DJ's know that and are quick to respond with requests, where appropriate, while interacting with audiences. Requests are our number one priority. We will play a great mix of customized songs to satisfy everyone. We know how important it is to have your special song played and we'll play it! ​We play what you want to hear, period. We don't play the same songs over and over. Our Play lists are custom tailored to reflect your personality and the uniqueness of your wedding celebration. We ensure this through pre-wedding consultation. Don't assume all DJ's use the same gear. Warning, not all DJ's are the same. The biggest mistake brides make is not doing their homework. 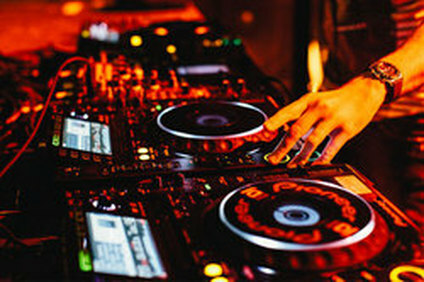 Dynamic DJ Service has innovated many widely used best practices in the industry. Once you look a little closer, you'll realize that we do all the little things right to give you a hassle free experience. ​We operate on a full time basis, are personable and come well dressed. 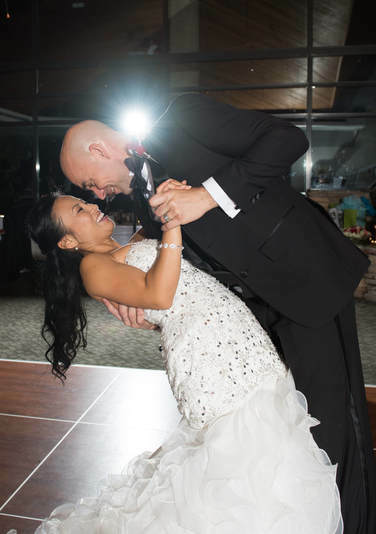 Get a birds eye view inside a Vancouver wedding DJ'd by the pros at Dynamic Weddings! 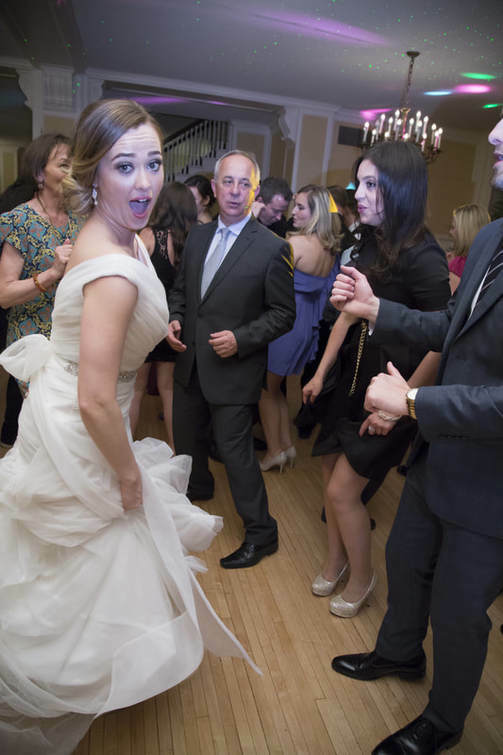 This was a Vancouver Jewish wedding with cultural elements we were able to accommodate for a wild fun ride! Watch for the flying chairs during the Hora! Mazel Tov! Did you know that our DJ service has been our flagship service for over 20 years? We also provide Photo Booth, Photography, Videography, Wedding Planning & Day of Coordination? "Nothing short of fantastic. Rave Reviews!" You won't find many DJ's who care to invest in a quality membership like us. Professional DJ's care about quality and our responsibility to you. 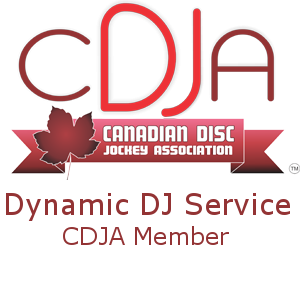 ​Members of the Canadian Disc Jockey Association are held to high Standards. We're happy to represent our community of DJ's. If you wish, our DJ's can include ice breakers and games to create a fun and interactive experience for your guests. Feedback we have received from our clients is that the energy and enjoyment of the guests was highly elevated due to the DJ's interaction. We're careful not to steal the spotlight from you so it's just the right mix. Our DJ's can also act as your professional and experienced MC's and are available at your request, freeing up your friends and relatives to enjoy the festivities. 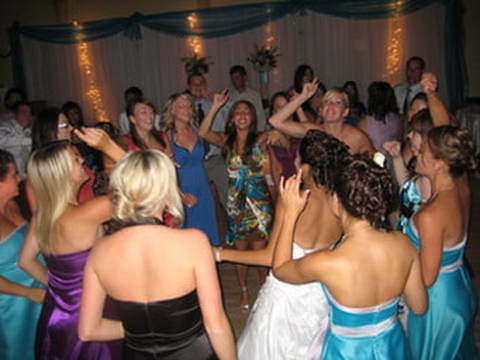 ​We typically MC over 60% of the weddings we DJ. "The dance floor was packed all night long." Since every event is different, we customize our packges and prices for each and every customer. You also get discount for off season events and even more when you bundle with our other services. ​Therefore, we require specific information in order to provide an adequate quote. ​Please fill out our contact form, email or call us to start planning your big day! What's good about our pricing? "Went above and beyond our expectations!" 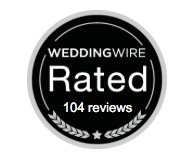 Over 100+ customers have rated us a perfect 5/5 stars. 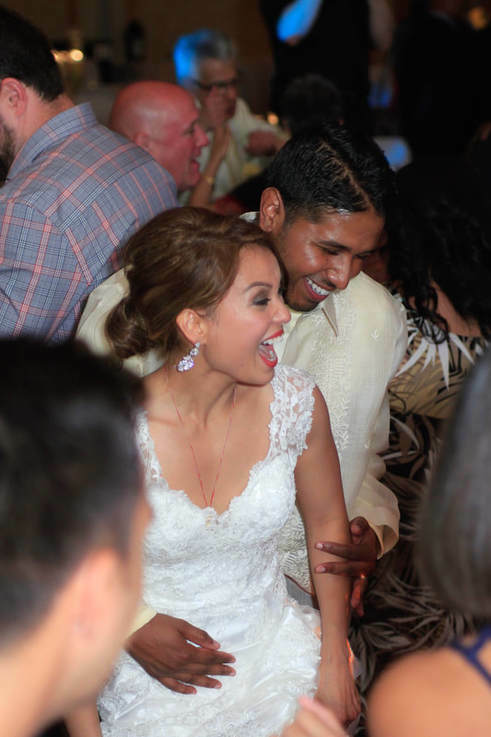 Here are a few real life clients on their wedding day singing their praise for Vancouver's Best Wedding DJ's! Watch more videos and testimonials here! Read our perfect 5/5 star reviews here! -Over 20 years of excellence in Metro Vancouver! Price, value and quality matter most to every couple we've worked with. We know that weddings can be expensive, that is why we created the Dynamic Weddings Best Value Guarantee. Our promise, is that we will provide you with better value than our competitors. 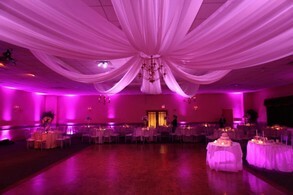 In addition, we offer add on services such as Uplights, MC and more! The convenience, savings and quality make us your "Best Value" choice! No matter what your budget, we have the right DJ for you! You've dreamed of this day for all your life. Don't let it fizzle with a cheap DJ. End your celebration with a bang. Given the financial challenges we continually face, getting the best deal possible is very important. However, the BIGGEST MISTAKE a bride will make is assuming all DJ's are the SAME. I can emphatically assure you, they are NOT! 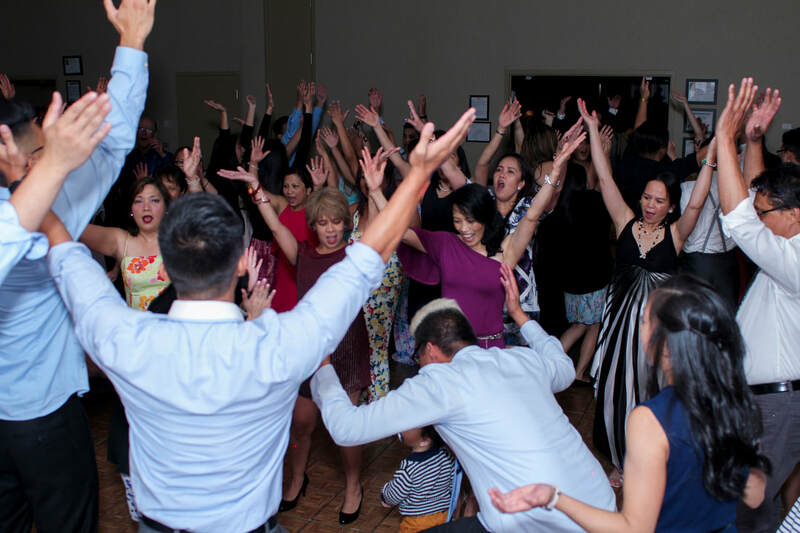 You will be delighted at our very affordable rates with a simple goal: to be the #1 DJ company in BC! 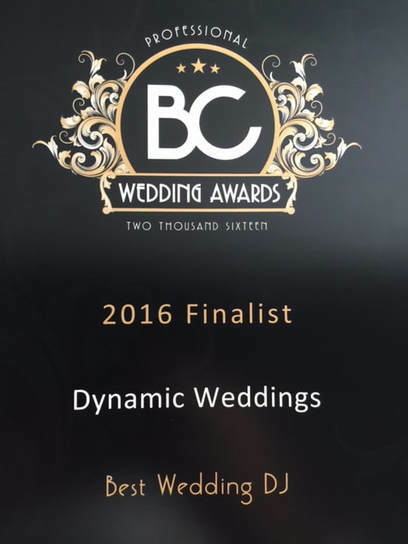 In fact, we were named BEST WEDDING DJ 2016 finalist at the BC Wedding Awards. We strongly believe that you should know exactly what you are going to pay right up front. We don't have any hidden fees. We strive to meet the needs of every customer and are willing to amend certain packages. Our goal is to provide superior service with reasonable rates. Compare our Gold DJ’s to most other DJ’s in the industry. However, according to our high standards, a Gold DJ is developing their skills in some areas. They all have the same quality of music and sound as our other packages. Regardless if they have 1 years or 10 years of experience, they will all start at this category until they have proven themselves to be in the Platinum DJ category. If you are looking to save some money, then the Gold DJ is for you! A Gold DJ would have about 7/8 out of 10 on our internal rating system. Your Diamond level DJ Dennis was named BEST WEDDING DJ 2016 finalist at the BC Wedding Awards. Dennis has been Vancouver's top DJ for over a decade and has a strong ability to interact with the crowd. DJ Dennis is very good at music selection for various situations, including events that require ethnic music. Dennis is the founder of Dynamic DJ Service and one of the most highly sought after DJ's in the Metro Vancouver area. Just read our testimonials and you'll see why! DJ Dennis has a rating of 10 out of 10. 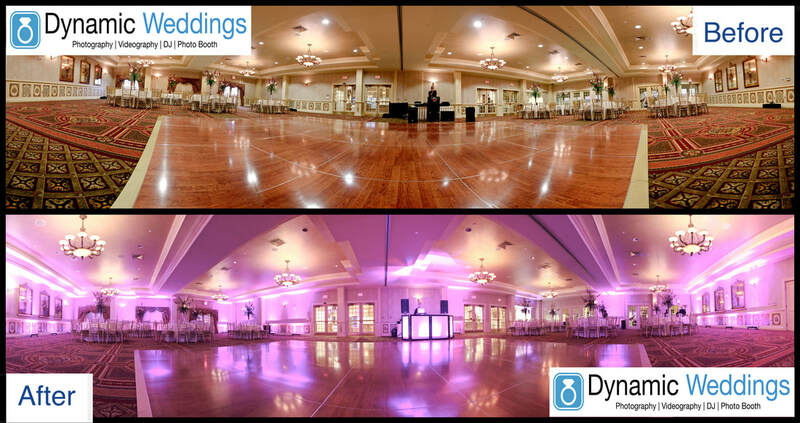 Dynamic DJ Service & Weddings Promo Video from Dynamic Weddings on Vimeo. Trent DJ & MC Extraordinaire!!!!! from Dynamic Weddings on Vimeo. Enhance your DJ experience with these very popular additions! Our professional DJ's do more than just play music. 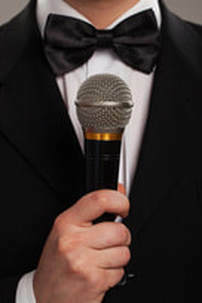 Rely on a professional MC to facilitate the flow of the evening and keep people informed. Most people don't realize how important the role of the MC is. They often choose the social and funny relative or friend. They may be great in social circles but keeping a large group of guests engaged, coordinating with vendors and keeping the schedule on time is very important. Frankly, most try but fail. Consequently, things run behind, professional vendors become upset and there is no cohesion. Allow your friend or relative to be a guest. Your DJ will take care of things, keeping the event running smoothly and working closely with your vendors. If you want the professional touch from your friend or relative, they can always come up for a speech or toast. 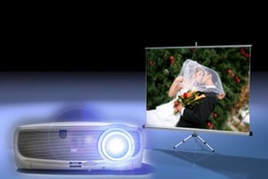 If you are having a slide show, we can provide the projector and screen. This includes set up and connection to our DJ system for the audio of the side show. We have two sizes, 80 inch screen (good for small parties) and a 120 inch jumbo screen (good for large parties). Transform your venue with uplighting! 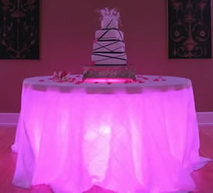 Our uplighting is an easy and affordable way to create a modern look for your wedding reception. Wow your guests by transforming the venue by adding elegant ambiance and colour that matches the rest of your decor. The uplighting ads that extra element of pizzaz! ​Uplighting transforms your room via LED lights placed directly on the ground pointing upwards. Choose from seven different colour options and transform your room with colour. 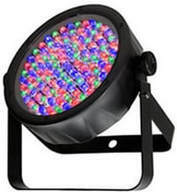 Our lights cost $39 each unit only when added to our DJ or Day of Coordination services. A small amount to pay for such a priceless experience! Have more questions? No worries. ​We've compiled a list of questions which we've received in the past to help you with your decision. Please don't hesitate to ask if you have any other questions. We offer exceptional, personalized service, working with you to make your celebration fun and memorable. We integrate your unique style in a way that makes the reception uniquely yours. Since we are owner operated, you can be assured nothing but the best. Our personal reputation is on the line. We are in this business because we love music and this industry. Yes. We are fully insured. We carry both property and liability insurance. Do you provide a written contract? Yes. You receive a copy of your contract when you secure our services. You receive a copy of it which verifies that you paid your deposit. 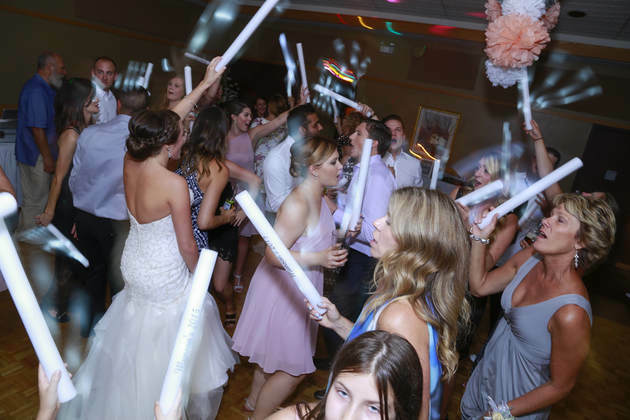 Although we DJ at hundreds of events such as corporate functions, school parties, bar and bat mitzvahs, our specialty is weddings. How long have you been in the DJ industry? The owner of Dynamic DJ Service has been in the DJ industry providing superior service since his late teens. Dynamic DJ Service was registered in the late 1990's. Will my DJ also act as the master of ceremonies? We provide MC service at an additional charge. Allow us to use our experience and keep your guests involved throughout your event. We are comfortable speaking in public and pride ourselves in our ability to keep your event organized and running smoothly. Part of this should include announcing and coordinating all of the special events for you. Most clients mistakenly assume that your DJ needs to be funny or known to them. Your friends and family will tell the jokes and stories about you. The role of the MC is simple. (1) facilitate the flow of the evening, (2) keep people informed. We strongly believe that having a professional DJ makes an enormous difference in supporting a seamless transition from one phase of your evening to another. Next question...at the end of the answer, add.."You can also download a helpful MC guideline with helpful hints that we have designed. Will you help us co-ordinate the reception If we have our own master of ceremonies? We provide you with a sample itinerary and an information sheet which gives you information on planning your reception. We have also designed an information sheet to give to your MC which will give him some helpful information. We will dress according to your dress code. Your DJ will always be dressed appropriately. Typical attire is dress shoes, dress pants and a collared shirt. Do you play games or activities? We have developed several activities that are designed to motivate and encourage your guests to have fun. These give your guests a lasting memory of your occasion. Most people book about 9-12 months prior to their function. Please note that we cannot secure your date until the deposit has been paid. Unfortunately, a few people have been disappointed to learn that the date had been filled until too late. Will you provide a song list to choose from? Yes, with over 200,000 songs to choose from, the possibilities are endless! We have multiple lists of music categorized in various genres and by the decades. We also have multiple weddings lists to choose from. Are you willing to play songs that are not in your collection? Although it's very unlikely we won't have a song, we can easily obtain almost anything. If you have something obscure or unreleased you can electronically send it to us. Will you take requests from us of songs to play and what not to play? Absolutely. We customize every event for our clients. We encourage you to complete a request list ahead of time and your guests can come forward and make requests as well. Our lists are categorized under the headings of "Must Play", "Play If Possible" and "Do Not Play". Will you take requests from guests? If you want us to, yes. Some clients want a specific type of music so request that we don't take guest requests but must clients want us to play to the crowd. If that's you, we'll be happy to accommodate. It's your party after all. We have request lists at the DJ table and we invite them to come forward at anytime to make requests. How many breaks and of what length do you require? We do not take breaks. Music will be played continuously throughout the evening. The only stop in music will be during speeches. If you should have to cancel, will you provide a back up? We have never cancelled and don't intend to. We have a large selection of professional and very qualified DJ's whom we work with and can refer to in times of emergency. How much time do you need to set up? We typically arrive 1 hour prior to our start time and will be completely set up with background music playing as your guests enter the hall. Our set up is simple and professional. All cords are neatly tucked away and are all black. Congratulations for selecting Dynamic Weddings DJ service to celebrate with you! We've got your back! Securing our service is simple. We will need a 25% first payment and signed contract. Payment can be by Cash, Email Money Transfer or Credit Card. Simply call or email us today! It may be best to fill out our contact form and tell us some information about you and your wedding. Let us know if you are interested in other services so we may determine your discount. Once booked, we will send you a comprehensive wedding information package complete with many song lists with various categories to help you select your special songs, detailed wedding day itinerary to help you plan your day, a detailed planner form to let us know what you like and many other helpful information. We're also happy to invite you into our studio to discuss in person at anytime!